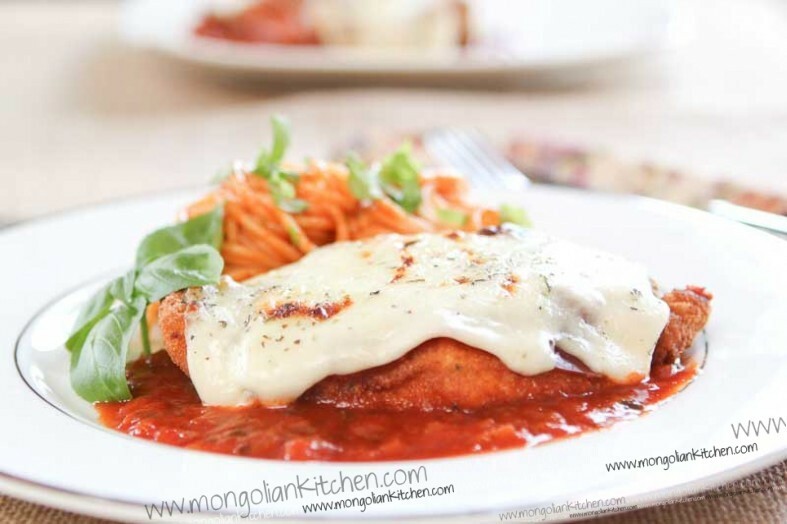 Parmigiana is a classic southern italian dish that should normally be made with aubergine or eggplant layered like a lasagne then baked. This is the chicken version which is made with breaded chicken breast. 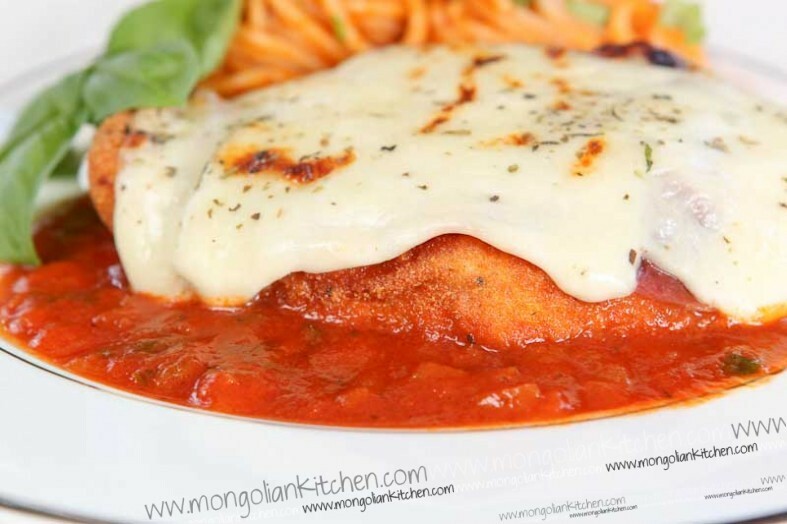 The fried, breaded chicken is topped with parma ham, mozzarella cheese then baked or grilled with a tomato sauce. The version that we make is quite simple. 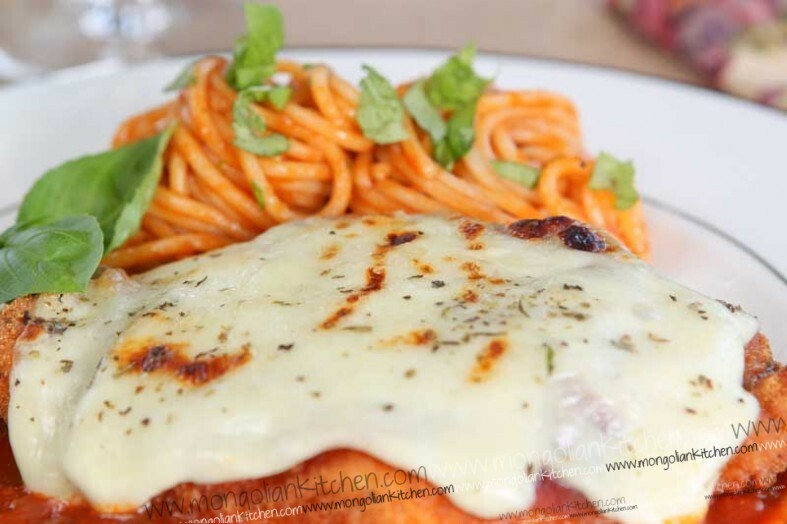 You start by preparing a delicious basil tomato sauce which the chicken is served onto (and there is some in the middle between the mozarella and ham). Then you simply bread and fry the chicken breast. When you are ready you place the chicken in an oven tray and cover with the toppings and place under the grill. Once everything bubbles and grills you serve on top of some more tomato sauce. Simple and easy to prepare in advance if you are making for a dinner party. 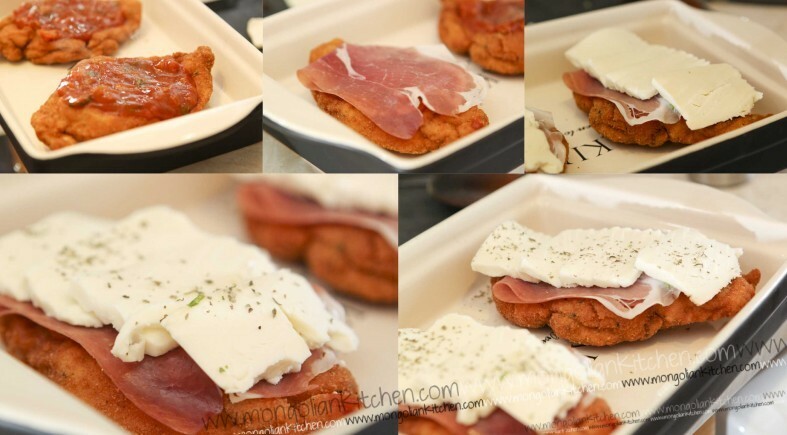 The combination of melted mozarella cheese with the crispy fried chicken and the basil sauce is just delicious. We also had some spaghetti on the side to complete the dish. Chop the onions and soften on a medium heat in a little oil, then add the garlic puree, tomato and sun dried tomato puree and cook for a further 5 mins. Add the marsala wine and allow the alcohol to evaporate and reduce in volume, meanwhile dissolve the stock cube in a mug of hot water, then add with the passata to the onions. Add the paprika, a good pinch of dried herbs, a pinch of sugar and black pepper. Allow the sauce to cook for 5-10 mins before checking the seasoning and addition more salt or pepper. Adjust the amount of salt, pepper and mixed herbs to your taste. Turn down the heat and allow to gently simmer for 20-30 mins. 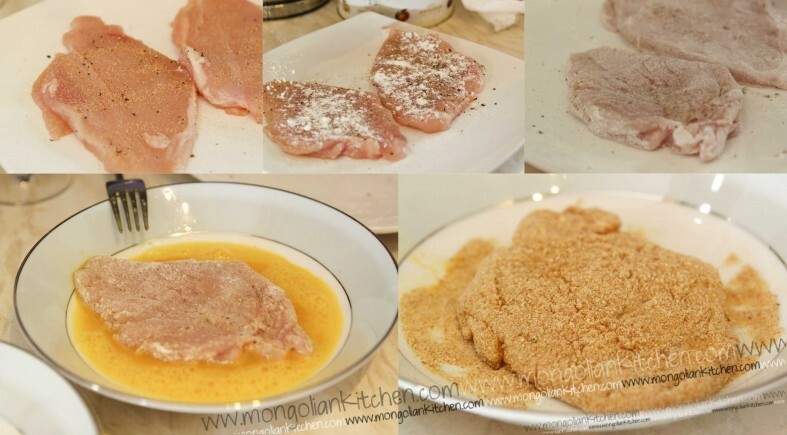 Using cling film or a plastic bag and meat mallet gently flatten the chicken breasts so that they are the same thickness all around but still not thinner then 1cm. Season the chicken with salt, pepper and garlic powder on both sides. Beat the eggs and season with salt and pepper. Dip the chicken in the flour, dust of excess then dip into the egg followed by the breadcrumbs, ensure the chicken is completely covered in egg and breadcrumbs. Deep fry in a deep pan or fryer for 10-15 mins or until golden brown. Remove and allow the oil to drain. Check the sauce is ready and add some freshly chopped basil. Place the chicken in an oven proof dish. Add a layer of sauce on top of the chicken, followed by a layer of ham and finally the cheese. Sprinkle with dried herbs and place under the grill for 5-10 mins until the cheese is golden. Serve with more sauce and a sprinkle of parmesan cheese. i would love to try all your new recipes of chicken.